Do you class your watch as wearable tech? Many of you wouldn't, as wearables are usually gadgets that connect to other gadgets, most usually a smartphone, and traditional 'ticking hands' watches don't do that, do they? 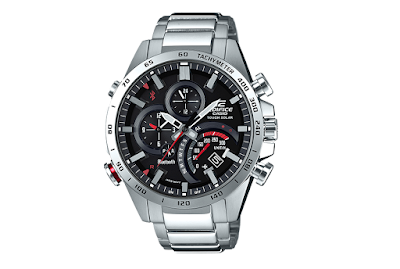 Well, some do, and we've spent some time (tee hee) getting to know one such 'smart' watch, the Casio Edifice EQB-501. The Casio Edifice EQB-501 is as smart as a watch can get without actually be a smartwatch such as the Apple Watch or the Samsung Galaxy Gear. That is because this watch can indeed connect to your phone via Bluetooth, allowing you to use the companion Casio app to do a lot more with it than your granddad ever did with his timepiece. Powered by a solar panel - yes, the dark section of the watch face is actual solar photo-voltaic material - you pair the watch to your phone following the set up instructions in the app. After that, the watch and the phone are constantly communicating, but not to display notifications like texts and calls. 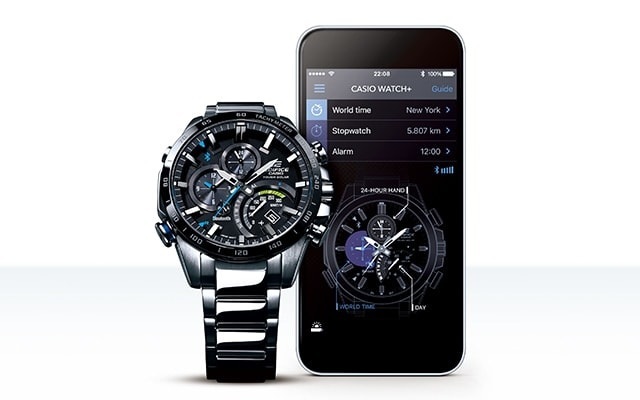 The Casio Edifice EQB-501 is actually seeking confirmation from your phone of the exact time, and as you phone is connected to the internet and therefore the true time of the timezone you're in, it'll get an accurate answer. That constant wireless link can also be used as a phone-finder, so if you misplace your handset you can tap a couple of buttons on the watch (which will always be on your wrist) and the phone will chirp up. Trust us: it saves a tonne of time in the morning. The Casio app shows exactly what else can be done with the phone, and as well as offering a handy guide to your watch (detailing what happens when you double-press that top right button, etc.). In the app you can set a secondary timezone which can switched to at a push of a button on the app, and also an alarm. Stopwatch mode has also been souped up, as all the data physically collected by the watch can be sent to your phone for safe keeping. In the use the Casio Edifice EQB-501 is hot-damn gorgeous, and as our attention has been focused on the empty black faces of smartwatches of late, it was refreshing to gaze in wonder at the multifaceted face of this Casio. Unashamedly masculine and physically domineering, the Edifice EQB-501 is a chunky beast that you certainly won't forget that you're wearing. The level of detail on the face is amazing, with everything being sharp and clear, even the tiny numbers on the speedometer. It simply feels like a quality product; like a grown up and sensible watch. Which is probably a strange thing for grown men to say about something, but with wearable tech emphasis lately on things with screens, we had forgotten how smart and classy a watch like is can be. The Casio Edifice EQB-501 is as smart as a non-smartwatch gets, and we love it.